Marlette Lacey, living history interpreter and author, was born and raised in Washington, D.C. She has an Associate’s Degree in Business Administration from the University of Maryland. 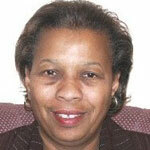 Ms. Lacey has 39 years of service with the federal government. She currently manages the Student, Youth, and Volunteer Programs within the Rocky Mountain Region serving eleven National Forests throughout Colorado, Wyoming, South Dakota, and Nebraska. Marlette facilitates Valuing Diversity training and was founder of the Lakewood Area Chapter on Blacks In Government in April 2001, and is now Chapter President. Marlette is an author a newly released book, From Slave To Water Magnate: The Story of Sarah Bickford. She also does living history on the life of Sarah Bickford, a former slave who became owner of the Virginia City, Montana Water Company. Bickford was the first African American Career Businesswomen in Montana. Marlette’s favorite pastimes are cooking, fishing, gardening, dancing, and housework.